Going through PHX to PHL is $1k each return trip. That would be $2k to renew the status. I found the LAX-PHX-JFK-CLT-RDU-MIA-PTY return for $1k as well. It yields 680 TPs. Could this be optimized (more TPs or smaller cost) ? It can, look at previous post #2622 , Rossmacd seems to have the PTY routing possibilities memorised. I think you slot LAS after LAX and MCO after RDU, giving you the extra 80. But it's also exactly what you said you didn't want to do. I don't think you can construct one of these many segment routes without ending outside the USA, if cost is important. I think Guatemala City and San Juan might be other options, but I guess these are the same as Panama, although doesn't San Juan have a sort of dependant territory status for USA. Last edited by dougzz; Aug 20, 17 at 3:41 am Reason: Added cost comment. I followed your lead and am now booked in November. Unfortunately I couldn't get onto the AY A350 this time but did manage A class on both transcon legs! similar prices for HKG/ICN/NRT/CAN/PEK/PVG and OJ possible same 840 TPs. Positioning is usually more pleasant in MUC. Has anyone succeeded in booking one of these online? If so how/where? Using bookwithmatrix I get directed to flightnetwork and priceline, both of which fail. Am I better off just phoning UL ? no success with OTA, so booked through the AMEX Plat travel desk. UL was a hassle of having to send photocopies of passport / credit card, etc, so I just went with Amex; they do well in finding I availability on the QR flights via waitlist before ticketing, which is sometimes elusive at peak times (e.g. at end of Ramadan). This time I'm asking on behalf of a work colleague. She is trying to get c400-500TPs to qualify for a GUF2. She will have a 3 day window over the third weekend in November based in LAS. Also UK based from 28Nov to 5Dec and isn't averse to an ex-eu. What do you think my be a good plan? I have tried the various routes I sometimes use but they usually only net 250 ish. Could I be so bold and ask for help again please? 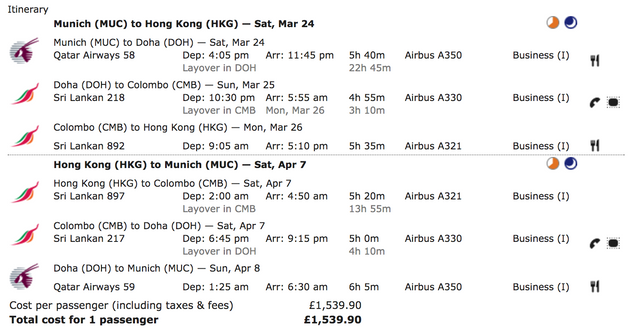 I booked a similar route but to MLE rather than HKG. I couldn't find any way to do it online so phoned UL. I got the flights booked (eventually), but it required several hours on the phone spread over a few calls, including trying to get a duplicate credit card charge refunded. The whole process was massively over-complicated - they didn't ticket it for ages because they couldn't see that any money had been paid from my credit card, despite my bank confirming that it had been paid. In summary, it will work phoning UL but if you can find a better way you'll save yourself a lot of hassle. Great fare - are stopovers allowed do you know? Where/how did you book - Flightcentre having trouble booking it? Managed to get Trailfinders to get the price. Hopefully will be ticketed tomorrow. If she is based in LAS, I have seen some quite good fares to SJU from SFO or LAS recently - you can pick up quite a few TPs running around the country on those (below gives you 480) or LAS-PHX-LAX-SFO return can net you 240 for under £500 at the moment. Just booked - ARN - LAS for £1500 and 1020 TPs. Thank you to the collective board and my Tallin Do friends for getting me the best deal that I could think of! Never feel sad - if the price is right for you when you push 'buy' then it is all good. I actually have another flight to SFO that I thought was good value until this one came up! Hi aks120. Always been in awe of the TP runners but have the opportunity to use your creative routing for a family member's stag do in Vegas to avoid travelling in steerage with them on the direct route and of course earn a few extra avios and TPs! Only problem is having found the routing on matrix, copied it into Book with Matrix, worked though the AA.com booking pages (where the fare quote is in Dollars), the payment page kicks me out when I say I have a UK credit card. What's the trick to pay for this? credit card number. Record locator was immediately given and tickets were issued 10-15 minutes after. Use the ITA Powertools thingy (referenced elsewhere in this thread) - you then have a choice of going the European AA site and it is OK with European issued credit cards. I found the price slightly cheaper due to exchange rates too.